Just One Block Back from beautiful Long Sands Beach, sits this newly renovated, adorable condo. Newly renovated with bamboo flooring throughout, all new furniture, new wall mounted flat screen TV with cable, wifi, new stove, new bathroom with 4 foot shower and so much more! The house also has window AC, gas grill and a new picnic table to enjoy meals outdoors. One bedroom has a queen bed and the other has a full plus there is a pullout couch with a double to make sleeping for 6 people. There is parking for 2 cars. 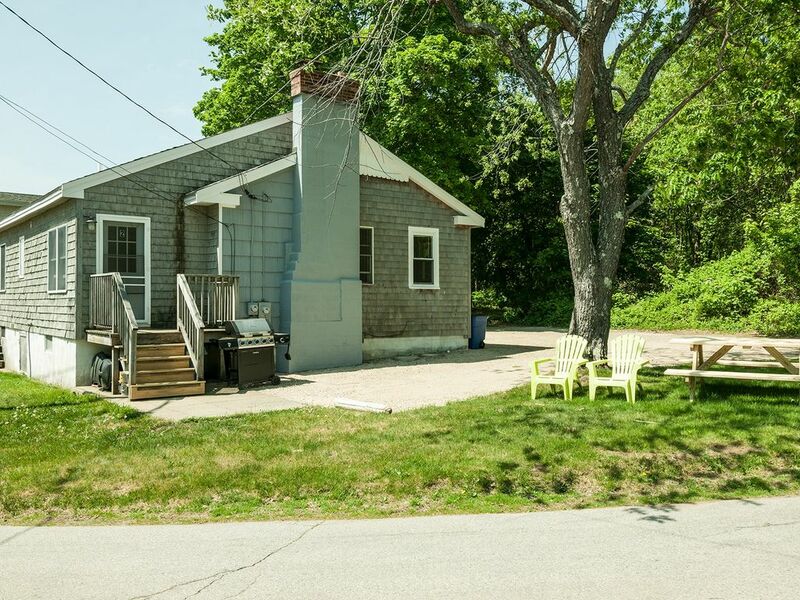 The property is only a few hundred yards from the ocean at Long Sand Beach. Walk to the beach in the morning, walk home for lunch and return in the afternoon. So close! The trolley stop is very close so you can take that to downtown York Beach, where you will find restaurants, bars, shopping and York's Wild Animal Kingdom and Amusement park! guests are responsible for providing their own linen although arrangements can be made to rent linen from us if needed. pull out queen sleeper sofa and chaise lounge so that the cottage can accommodate up to 6 people. Clean and comfortable, this place fit our needs perfectly. We loved the quick walk to the beach and the quiet neighborhood. We will be sure to return again! The rental was fully equipped and impeccably clean. We had everything we needed and more. The owners were a delight to work with. We will be back again. Perfect weather, close to beach and a well equiped little house. Can easily serve 6 for a lobster dinner and accomodated the 4 of us comfortably for days. Very enjoyable! Would reccomend to anyone. This unit has 2 BR 1 bath and comes with everything you could possibly need for your ocean getaway! It's an easy walk down to the beach/main oceanside road. It comes with a stocked kitchen of utensils and plates/cups etc. There's even cable TV if you have inclement weather and are stuck inside. We were thrilled with our stay and look forward to booking again! Our vacation week at this cute place was great! We had a very enjoyable stay. The house was just as described...clean and close to Long Sands Beach. Internet service was great and furnishings and beds were immaculate and comfortable. Renee is pleasant and helpful. I would definitely stay here again! We spent a week here in July and it was PERFECT!! The location is so close to the beach that we could go back and forth whenever we wanted- and we would often walk up in the early AM or later in the evening, just to walk the beach. The cottage is updated and has everything you would want or need. I only wish we could have stayed longer! York is a wonderful place to vacation! There is everything a family could desire. There are 4 public beaches, historical sites to visit in York Village, play grounds, an amusement park and wonderful dining. This rental property is less than a 5 minute walk to beautiful Long Sands Beach. Enjoy swimming, surfing, paddle boarding or just relaxing on the sand! Jump on the trolley to head to downtown York Beach for a day of shopping or an evening of dining. Visit work famous Nubble Lighthouse or take a drive to Ogunquit for the day. So much to do, but be sure to just relax and enjoy Maine, the way life should be!